Overcombe is a wonderful two bedroom seafront apartment has views across the entire bay of Woolacombe and overlooks Combesgate beach, a popular surfing beach one end of Woolacombe Bay. It sleeps four comfortably in two bedrooms. Overcombe is next door to Cliff House. You will find it hard to beat this outstanding location with some of the best views in the resort. Overcombe has a large lounge with a brown leather suite (3 and 2 seater) where you can sit to take in the view if you are not outside on the south facing terrace enjoying it! Digital TV with Blu Ray, DVD/Video, a CD/radio player with MP3 socket and WiFi are available along with games, books, DVDs and videos. There is even a TV/DVD iPod dock and video player (there are some childrens videos to watch) in the 2nd bedroom. There is a fold-away table and chairs in the living room as an alternative to dining outside or in the kitchen. The dining table in the kitchen seats four and the kitchen has a washer/dryer, microwave, fridge/freezer and full size dishwasher. The front bedroom has an extensive sea view with a king size bed and TV. Sit up in bed and see the sea! Simply wonderful! The 2nd bedroom has 3' twin beds and has a small en suite shower-room, TV/DVD/iPod dock and video player as there are a selection of childrens videos available. 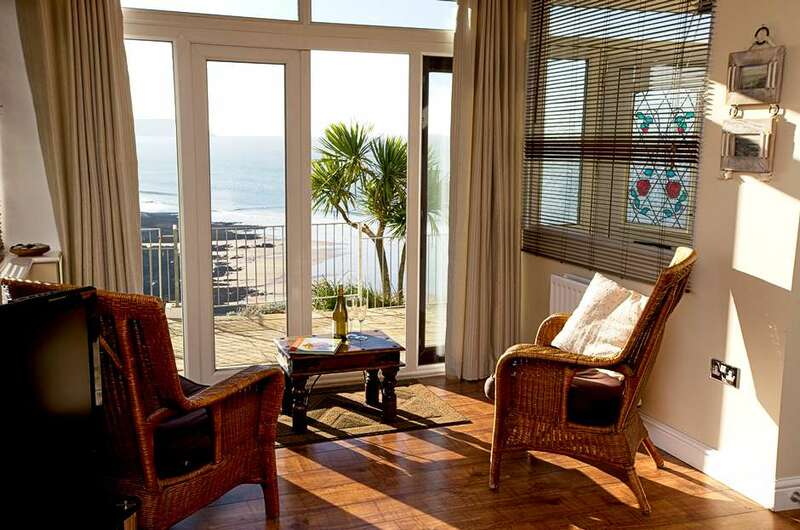 Both bedrooms are tastefully decorated in keeping with this lovely coastal setting. There is also a family bathroom with shower over bath. Saturday Changeover. Bed linen and towels provided although you will need to bring your own beach towels. Parking for 1 car. Check-in after 3pm and check out by 10am. Heating and hot water inclusive. Sorry no pets. Travel cot, high chair, bed guard provided along with some pre-school and primary school age childrens videos and books. Parking strictly for one car only. Storage for boards and wet suits in store area just inside the garage (owners have the remainder locked with their things). There are staggered steps from car parking area to apartment.